Bastion is best seen in the summer. It’s one of the more glorious ruins on Mars, built with as much architectural drama as any Progenitus structure. If you’re coming from the North, you’ll see most of the best the corpnation has to offer as you journey through Lianthe’s faded urban glory, northside Shobolan’s strange tribal commune, and its occasionally amazing gardens. Further south than that and at best it’s more of the same, at worst a toxic wreck with an abnormally high body count. The glory days of Bastion, if it ever had any, are long in the past. Bastion, named for its parent company, was founded in 170 AE, cut from some of the more hospitable territory that was held by Genotype, a land-grab by the cat-owned company that had helped feed Genotype’s destruction. The Megacorp called Bastion had made weapons-dealing and mercenary soldiers its primary trade, and made a business practice of working every side of a conflict, even creating more, to fatten its purses. 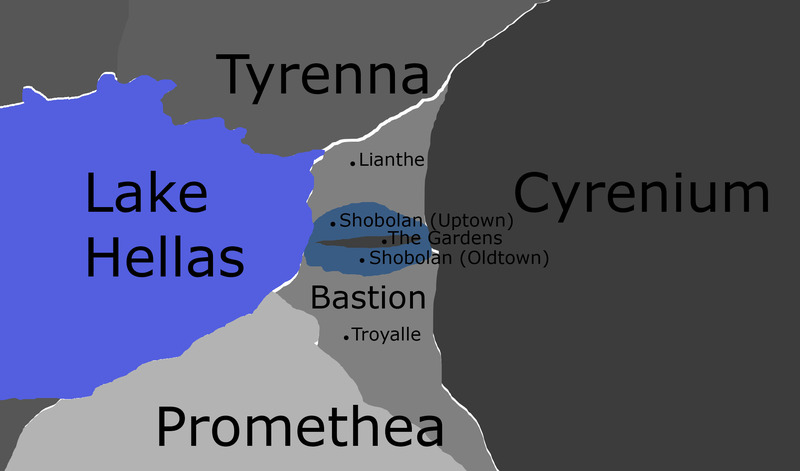 As Vectors gradually entered the age of interplanetary travel and space piracy, maintaining a stable and happy citizen population became less profitable, and the Bastion megalopolis became run-down, more of its land used for industry, the waters of Lake Hellas absorbing runoff and debris. It was not a happy place, nor one populated with happy people. Bastion’s death knell (as a Megacorp and as a Corptown) sounded in about 450, when the IRPF emerged as an interplanetary police force, cleaned up the space lanes, and provided a cost-effective alternative to war. Bastion’s primary revenue stream dried to a trickle. In 520 AE, Bastion banged the drums of war one last time, gambling that the Felidae family could be turned against a common racial enemy (this time, the rabbits). They lost the gamble, and ultimately were stripped of their corporate authorization by another cat-held corporation. Today, Bastion stands as an object lesson in corporate responsibility…to their customers, their citizens, and in this one case, to Vectors as a whole. Bastion is a small crescent of land carved out of Promethea along Lake Hellas. With a very few parks and lakes, it’s one sprawling cityscape. Early in its life it was quite luxurious in places, particularly along the lakeside where tall, elegant residential spires grew, and around the eastern edge of the crescent where glittering buildings rose miles into the sky, looking over the corpernation and preserving the penthouse views of glittering Lake Hellas. The central zone of Sholoban was constructed with local black basalt, and was primarily the home of lower-status corporate employees. Lianthe and Troyalle are both mixtures of industrial and high-end residential, and walking through Bastion gave the impression of a sweeping valley of buildings. From overhead, it resembled a great cat’s eye. Today, Bastion is an urban wasteland…mostly. As the corptown began to break down the balance in Lianthe and Troyalle shifted toward manufacturing, and even the skyscrapers overlooking the water have been repurposed for industrial use, strange hybrids of elegance and ugly utility. Much of Sholoban has become a squatter’s camp, and its central park and garden have grown wild and become something of a kinder, gentler Longbow. But a strange streak of perverse creativity, good-tempered anarchy, and community runs through the slums and vine-covered towers. MarsCo occasionally turns its eye toward Sholoban as a potential grotto, but thusfar it’s stayed on the grid and, in some small way, plays its part in Mars’s economy. Bastion is several things. It’s a place where corporate pride led to corporate downfall. It’s a crypt of the past, one that’s already been ransacked several times, but in a region that big with that many centuries of building and rebuilding, there’s always more secrets to be uncovered. It’s an alternative to the heavily commercialized Vector lifestyle, but one that’s still dependent on MarsCo’s resources. It’s a bug hunt on a vast scale. It’s a comedy set where hucksters and carnie-folk try to con the PCs. At heart, Bastion is vast, old, and dead, but it still sustains new life…for better or for worse.